Scouting Strus: He declared for the draft without an agent, so what are his odds of going pro? But by being friendly to people and awkwardly initiating conversations at credentialed events, I’ve formed relationships with enough legitimate experts to write informed stories with semblances of intelligence. 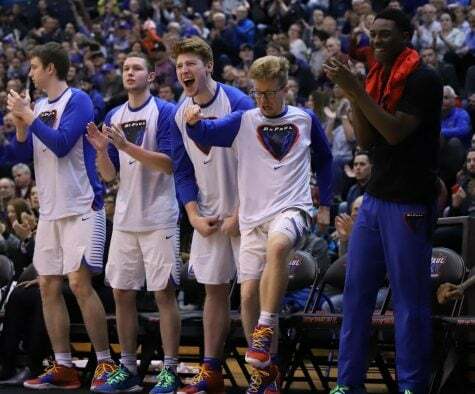 When DePaul Blue Demon basketball star Max Strus announced at the end of March that he would declare for the 2018 NBA draft, many questioned whether the 6-foot-6-inch, Hickory Hills, Ill. native has what it takes to make the leap to the next level. To get a feel for the answer, I tapped into my network of smart basketball people. Ideally, I would have had access to NBA scouts. I talked to one of these magical people at a Windy City Bulls game last winter and he told me some interesting stuff, but I didn’t have the foresight to ask for his number or email. So, really smart writers were the next best option. 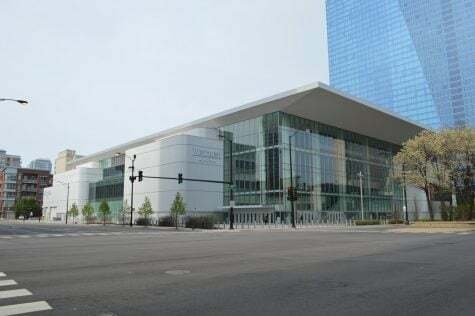 The analysis and commentary for this story comes from SB Nation editor Ricky O’Donnell, NBC Sports Chicago contributor Scott Phillips, and 670 The Score radio host and Blue Demon color commentator Laurence Holmes. 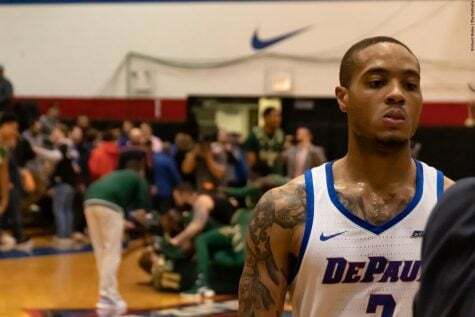 Strus is a 6-foot-6-inch, 215 pound wing player who transferred over to DePaul two seasons ago from Division II Lewis University (he sat out 2016-2017 in accordance with NCAA transfer policy). 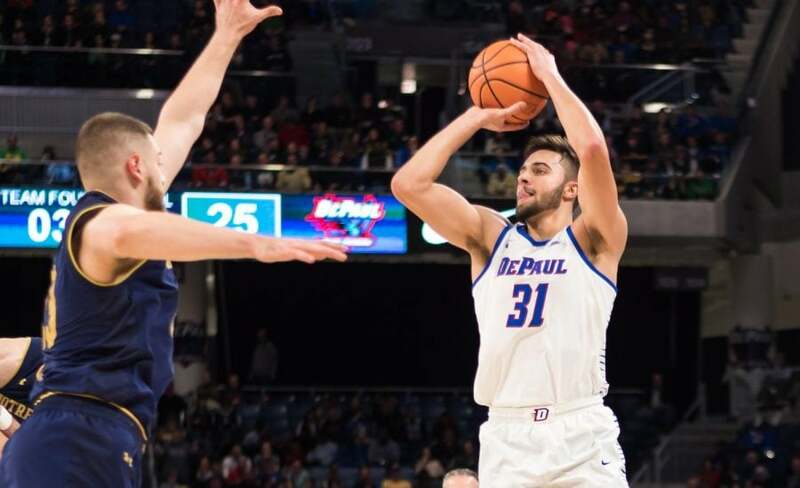 Last season, to incessant chants of “Struuuus” from the Wintrust Arena crowd, he led all Blue Demon scorers with 16.8 points per contest, nailing 40.8 percent of his shots on a team-high 13.5 field goal attempts per game. 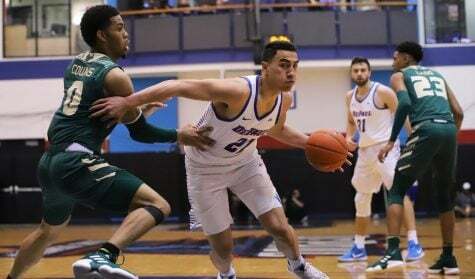 The focal point of the Blue Demons offense for much of the season, the redshirt junior exploded for 12 games with 20 or more points including season-high totals of 33 points against Northwestern and Xavier. With his size and strength, he was also a good rebounder for his position averaging 5.6 boards per contest. A grinder, Strus averaged a team-high 35.7 minutes per game and was one of four Blue Demon players to play in all 31 of DePaul’s games. On a Blue Demon team that finished 182nd in adjusted offensive efficiency per KenPom.com, Strus needed to be the go-to guy offensively. Scoring the ball is the meat and potatoes of his game and he uses an NBA-ready physical profile to help generate that scoring. Moving without the ball, defensive versatility that stems from his size and athleticism, and creating shots off the dribble were also mentioned as strengths by Phillips, Holmes, and O’Donnell. 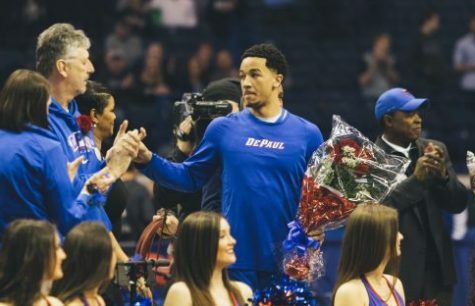 As counterintuitive as it seems, Strus’ role on this Blue Demon squad has allowed him to accentuate some of his strengths and both O’Donnell and Phillips believe he’d be best served remaining a Blue Demon. Billed as a lights out shooter, opponents defended him accordingly using double teams and traps to chase him away from the 3-point line or deter him from his path as he curled off down screens. The attention didn’t stop him from casting up 7.8 attempts from 3-point land per game (third in the Big East). Surprisingly, he nailed a pedestrian 33.3 percent of these attempts. Phillips mentioned shot selection as an improvement area for Strus. In an offense that struggled at times, Strus had to be a chucker and didn’t have much of an opportunity to showcase the full range of his offensive skillset because he was so focused on scoring. If he can flash playmaking skills, that would add another valuable layer to his offensive arsenal. In terms of defense, it’s a mixed bag. Strus didn’t shine in traditional defensive statistics like steals (1.4) or blocks (0.6) per 40 minutes, but the advanced metrics liked his performance on that end of the floor. He led the team with 1.4 defensive win shares while generating a defensive box plus-minus of 2.2. All Strus wants to do is win. Here’s his evaluation of his 27-point outburst in a Jan. 20 loss against Butler. “Teams always value high character guys, people who they can have at the end of the bench and they won’t cause a scene or be a big distraction,” O’Donnell said. Another strength for Strus in the intangibles department is that he plays with competitive fire. He also always plays like he has something to prove. This probably stems from the fact that he earned just one Division I scholarship offer (Chicago State) coming out of Stagg High School in Palos Hills, Ill. So, what they are saying is there is a chance? “I think he’s good enough to have a chance to play in the NBA someday,” O’Donnell said. Whether it’s this summer or the next, Strus has his sights set on the NBA. He’ll be pleased to know that there’s three really smart people (and a not so smart guy, me) who believe in his chances. Eventually, I think it would be terrific if Max were to make the NBA, in spite of what damage it might do to Jean Lenti-Ponsetto’s mysterious “Not Jr NBA” formula. 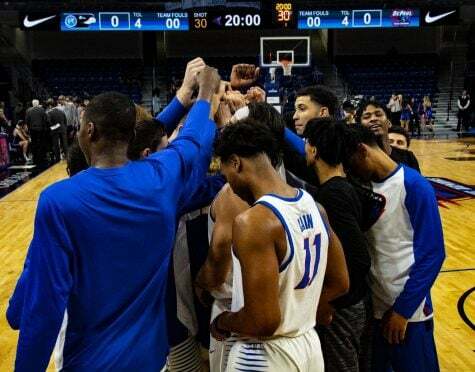 Sure, it might encourage interest and help recruiting, but there’s always risk involved when taking a flier on student-athletes who could potentially lower the team’s highly coveted G.P.A.. There might be jeers or nicknames aimed at a 5-Star player (i.e., “2.9” or “Study Hall”), but it might be coming from the rafters for a change. 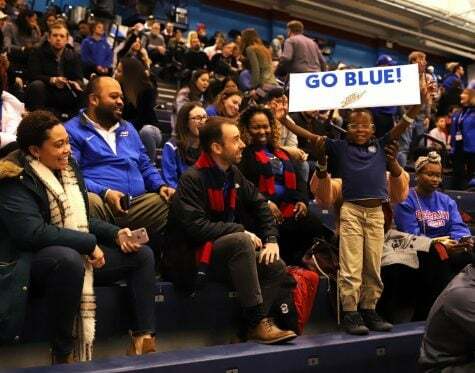 Or the DePaul student section where it will go unnoticed because both too far from the court to be heard by said 5-Star player (s) or picked up by the national television coverage that Coach Leitao complains isn’t ESPN. 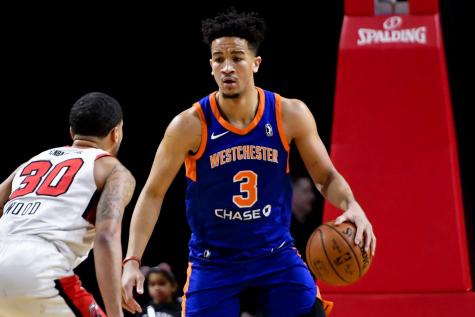 Max’s toughest decision has to do with whether the present coaching staff is capable of coaching him up and helping his game enough to make him NBA worthy. They’ll be on FS1 and sounds like there might even be scouts in attendance unless barred by #FireJLP. Good luck, Max, you’ve been an unexpected surprise. I think you can make it. Max will make the NBA despite going to DePaul. He’ll have it easier than Myke Henry, that’s for sure. 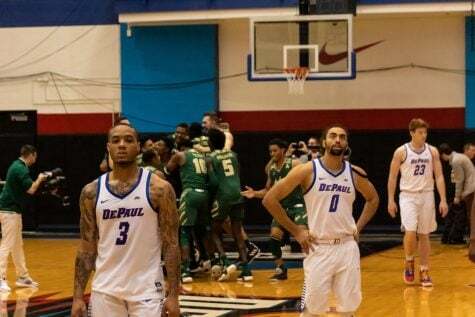 DePaul is merely a means of getting him exposure against top-tier D1 teams. When he’s dropping 33 against Xavier and 20+ on Nova, you better believe people are taking note. He wouldn’t have had the chance to shine at Butler/Xavier (other schools who courted a transfer) like he does here. He’s been fun to watch and I hope he hangs around another year, and maybe Cain will remember how to play basketball.